Which of these electric vehicles would get your VOTE ?? 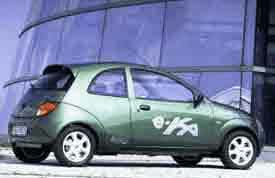 A: the Ford e-Ka - capable of 125 miles per charge and 80 mph. 1p-a-mile. B: the TH!NK City - 53 miles per charge and 56 mph. Also 1p-a-mile. Ford re-TH!NKs City for 2002 -but no change to range. - Ford would have us believe that the e-Ka - based on the best-selling, massively popular petrol-powered Ka - is "not commercially viable". - Why not let us know if you agree with what Ford's.... "experts say"? ++ STOP PRESS Sept '01 : Ford UK - experts in the "commercially viable" - announce record �650 (US$965) million(!!) loss. Ford global net losses for 2001 - $5.45 billion! ++Ford "Living in Alice in Wonderland Dreamland" says judge - in yet another billion dollar lawsuit-loss (ignition/stalling)++.